The two halves of the James Webb Space Telescope are now in the same location and ready to take the next step on JWST’s journey. On February 2nd, Webb’s Optical Telescope and Integrated Science instrument module (OTIS) arrived at Northrop Grumman Aerospace Systems in Redondo Beach, California. The integrated spacecraft, consisting of the spacecraft bus and sunshield, were already there, waiting for OTIS so they could join together and become a complete spacecraft. 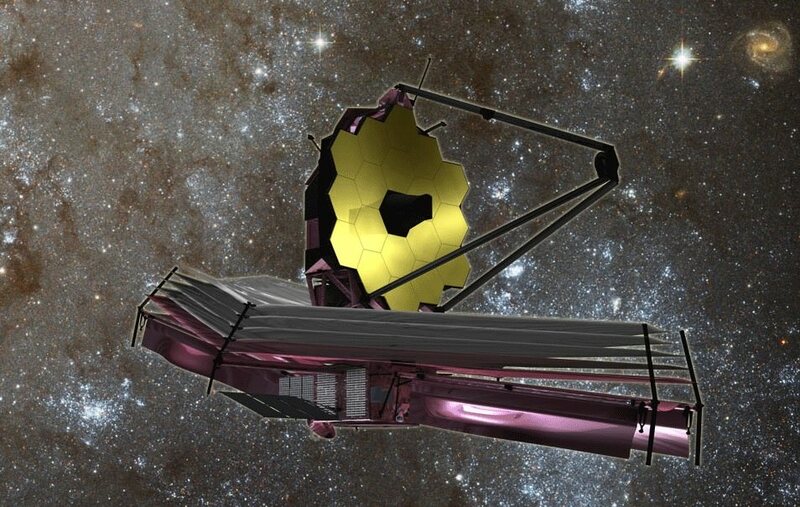 “The team will begin the final stages of integration of the world’s largest space telescope.” – Scott Willoughby, Northrop Grumman’s Program Manage for the JWST. OTIS arrived from the Johnson Space Center in Houston, where it had successfully completed its cryogenic testing. To prepare for that journey, OTIS was placed inside a custom shipping container designed to protect the delicate and expensive Webb Telescope from any damage. That specially designed container is called the Space Telescope Transporter for Air, Road and Sea (STTARS). STTARS is a massive container, measuring 4.6 meters (15 feet) wide, 5.2 meters (17 feet) tall, and 33.5 meters feet (110) long, and weighing approximately 75,000 kilograms (almost 165,000 pounds). It’s much larger than the James Webb itself, but even then, the primary mirror wings and the secondary mirror tripod must be folded into flight configuration in order to fit. The next step for the JWST is to join the spacecraft itself with OTIS. Once that happens, JWST will be complete and fully integrated. Then there’ll be more tests called observatory-level testing. After that, another journey inside STTARS to Kouru, French Guiana, where the JWST will be launched in 2019. “This is a major milestone.” – Eric Smith, director of the James Webb Space Telescope Program at NASA. You can’t fault people, either NASA personnel or the rest of us, for getting excited about each development in the James Webb Space Telescope story. Every time the thing twitches or moves, our excitement re-spawns. It seems like everything that happens with the JWST is now a milestone in its long, uncertain journey. It’s easy to see why. The James Webb ran into a lot of problems during its development. As can be expected for a ground-breaking, technology-pushing project like the Webb, it’s expensive. In 2011, when the project was well underway, it was revealed that the Webb would cost $8.8 billion, much more than the initial budget of $1.6 billion. The House of Representatives cancelled the project, then restored it, though funding was capped at $8 billion. That was the main hurdle facing the development of the JWST, but there were others, including timeline delays. The most recent timeline change moved the launch date from 2017 to Spring 2019. As of now, the James Webb is on schedule, and on target to meet its revised budget. 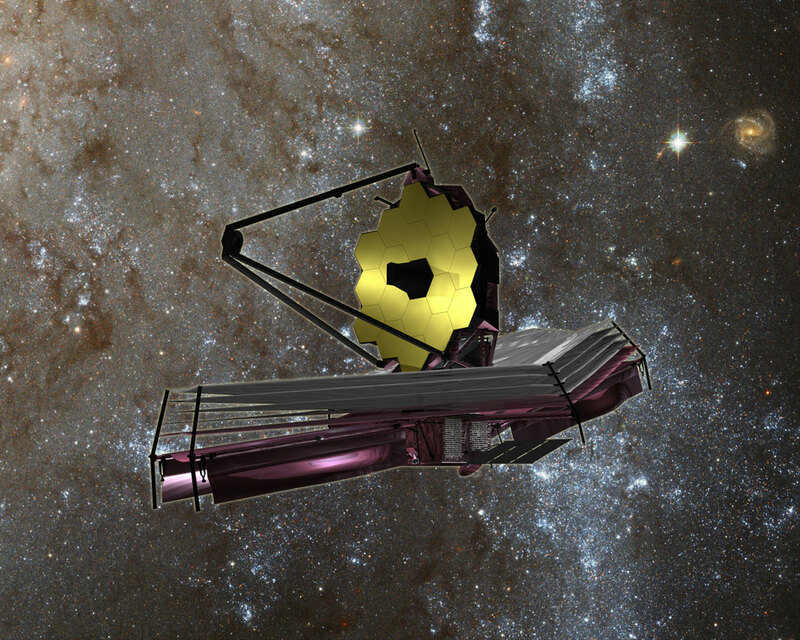 The JWST is the first of the “Super Telescopes” to be in operation. Once it’s in place at LaGrange Point 2 (L2), about 1.5 million km (930,000 miles) from Earth, it will begin observing, primarily in infrared. It will surpass both the Hubble Telescope and the Spitzer Telescope, and will “look back in time” to some of oldest stars and galaxies in the universe. It will also examine exoplanets and contribute to the search for life. NASA GODDARD SPACE FLIGHT CENTER, MD – It’s Mesmerizing ! That’s the overwhelming feeling expressed among the fortunate few setting their own eyeballs on the newly exposed golden primary mirror at the heart of NASA’s mammoth James Webb Space Telescope (JWST) – a sentiment shared by the team building the one-of-its-kind observatory and myself during a visit this week by Universe Today. “The telescope is cup up now [concave]. So you see it in all its glory!” said John Durning, Webb Telescope Deputy Project Manager, in an exclusive interview with Universe Today at NASA’s Goddard Space Flight Center on Tuesday, May 3, after the covers were carefully removed just days ago from all 18 primary mirror segments and the structure was temporarily pointed face up. It’s a banner year for JWST at Goddard where the engineers and technicians are well into the final assembly and integration phase of the optical and science instrument portion of the colossal observatory that will revolutionize our understanding of the cosmos and our place it in. And they are moving along at a rapid pace. JWST is the scientific successor to NASA’s 25 year old Hubble Space Telescope. It will become the biggest and most powerful space telescope ever built by humankind after it launches 30 months from now. The flight structure for the backplane assembly truss that holds the mirrors and science instruments arrived at Goddard last August from Webb prime contractor Northrop Grumman Aerospace Systems in Redondo Beach, California. The painstaking assembly work to piece together the 6.5 meter diameter primary mirror began just before the Thanksgiving 2015 holiday, when the first unit was successfully installed onto the central segment of the mirror holding backplane assembly. Technicians from Goddard and Harris Corporation of Rochester, New York then methodically populated the backplane assembly one-by-one, sequentially installing the last primary mirror segment in February followed by the single secondary mirror at the top of the massive trio of mirror mount booms and the tertiary and steering mirrors inside the Aft Optics System (AOS). Everything proceeded according to the meticulously choreographed schedule. “The mirror installation went exceeding well,” Durning told Universe Today. The flight structure and backplane assembly serve as the $8.6 Billion Webb telescopes backbone. The next step is to install the observatory’s quartet of state-of-the-art research instruments, a package known as the ISIM (Integrated Science Instrument Module), in the truss structure over the next few weeks. “The telescope is fully integrated and we are now doing the final touches to get prepared to accept the instrument pack which will start happening later this week,” Durning explained. The integrated optical mirror system and ISIM form Webb’s optical train. “That’s essentially the entire optical train of the observatory!” Durning stated. After OTIS is fully integrated, engineers and technicians will spend the rest of the year exposing it to environmental testing, adding the thermal blanketry and testing the optical train – before shipping the huge structure to NASA’s Johnson Space Center. “Then we will send it to NASA’s Johnson Space Center (JSC) early next year to do some cryovac testing, and the post environmental test verification of the optical system,” During elaborated. Webb’s optical train is comprised of four different mirrors. We discussed the details of the mirrors, their installation, and testing. “There are four mirror surfaces,” Durning said. In space, the folded mirror structure will unfold into side by side sections and work together as one large 21.3-foot (6.5-meter) mirror, unprecedented in size and light gathering capability. The lone rounded secondary mirror sits at the top of the tripod boom over the primary. The tertiary mirror and fine steering mirror sit in the Aft Optics System (AOS), a cone shaped unit located at the center of the primary mirror. “So how it works is the light from the primary mirror bounces up to the secondary, and the secondary bounces down to the tertiary,” Durning explained. So the alignment between the AOS system and the telescopes primary and secondary mirrors is incredibly critical. With the mirror structure complete, the next step is ISIM science module installation. To accomplish that, technicians carefully moved the Webb mirror structure this week into the clean room gantry structure. More about ISIM in the next story. 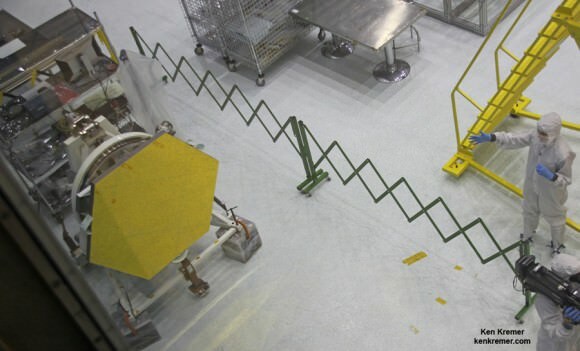 GODDARD SPACE FLIGHT CENTER, MD – The huge Sunshield test unit for NASA’s James Webb Space Telescope (JWST) has been successfully unfurled for the first time in a key milestone ahead of the launch scheduled for October 2018. Engineers stacked and expanded the tennis-court sized Sunshield test unit last week inside the cleanroom at a Northrop Grumman facility in Redondo Beach, California. NASA reports that the operation proceeded perfectly the first time during the test of the full-sized unit. The Sunshield and every other JWST component must unfold perfectly and to precise tolerances in space because it has not been designed for servicing or repairs by astronaut crews voyaging beyond low-Earth orbit into deep space, William Ochs, Associate Director for JWST at NASA Goddard told me in an exclusive interview. The five layered Sunshield is the largest component of the observatory and acts like a parasol. Its purpose is to protect Webb from the suns heat and passively cool the telescope and its quartet of sensitive science instruments via permanent shade to approximately 45 kelvins, -380 degrees F, -233 C.
The kite-shaped Sunshield provides an effective sun protection factor or SPF of 1,000,000. By comparison suntan lotion for humans has an SPF of 8 to 40. The extreme cold is required for the telescope to function in the infrared (IR) wavelengths and enable it to look back in time further than ever before to detect distant objects. The shield separates the observatory into a warm sun-facing side and a cold anti-sun side. Its five thin membrane layers also provides a stable thermal environment to keep the telescopes 18 primary mirror segments properly aligned for Webb’s science investigations. JWST is the successor to the 24 year old Hubble Space Telescope and will become the most powerful telescope ever sent to space. Webb will launch folded up inside the payload fairing of an ESA Ariane V ECA rocket from the Guiana Space Center in Kourou, French Guiana. In launch configuration, the Sunshield will surround the main mirrors and instruments like an umbrella. 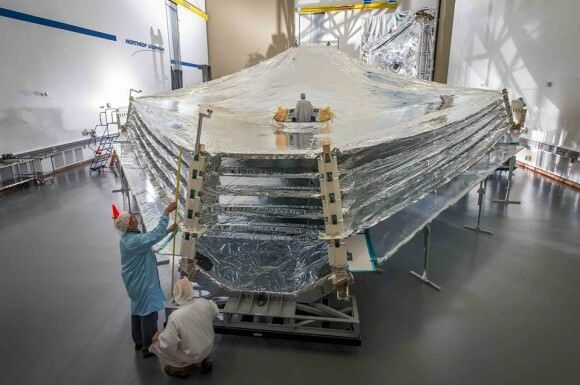 During the post launch journey to the L2 observing orbit at the second Sun-Earth Lagrange point nearly a million miles (1.5 million Km) from Earth, the telescopes mirrors and sunshield will begin a rather complex six month long unfolding and calibration process. 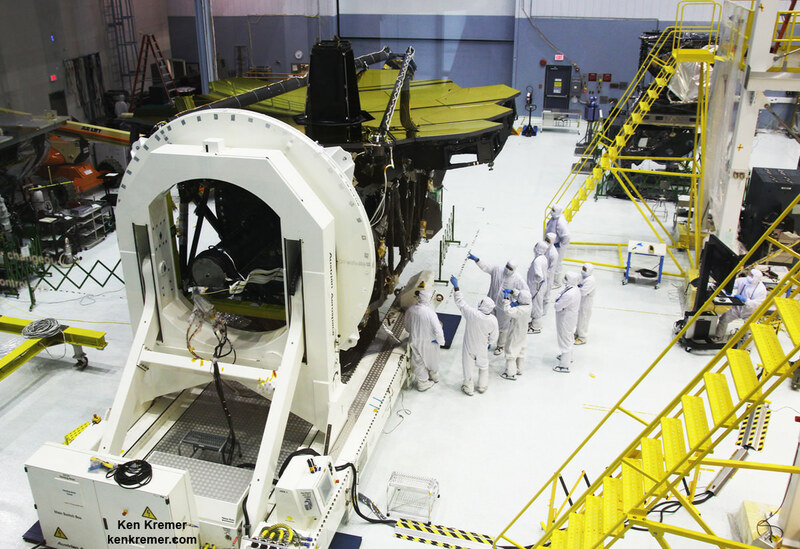 The science instruments have been mounted inside the ISIM science module and are currently undergoing critical vacuum chamber testing at NASA Goddard Space Flight Center which provides overall management and systems engineering. The mirror segments have arrived at NASA Goddard where I’ve had the opportunity to observe and report on work in progress. Stay tuned here for Ken’s continuing JWST, MMS, ISS, Curiosity, Opportunity, SpaceX, Orbital Sciences, Boeing, Orion, MAVEN, MOM, Mars and more Earth and Planetary science and human spaceflight news. In three years, NASA is planning to light the fuse on a huge rocket designed to bring humans further out into the solar system. We usually talk about SLS here in the context of the astronauts it will carry inside the Orion spacecraft, which will have its own test flight later in 2014. But today, NASA advertised a possible other use for the rocket: trying to find life beyond Earth. At a symposium in Washington on the search for life, NASA associate administrator John Grunsfeld said SLS could serve two major functions: launching bigger telescopes, and sending a mission on an express route to Jupiter’s moon Europa. The James Webb Space Telescope, with a mirror of 6.5 meters (21 feet), will in part search for exoplanets after its launch in 2018. Next-generation telescopes of 10 to 20 meters (33 to 66 feet) could pick out more, if SLS could bring them up into space. “This will be a multi-generational search,” said Sara Seager, a planetary scientist and physicist at the Massachusetts Institute of Technology. She added that the big challenge is trying to distinguish a planet like Earth from the light of its parent star; the difference between the two is a magnitude of 10 billion. “Our Earth is actually extremely hard to find,” she said. Much like our solar system, Kepler-62 is home to two habitable zone worlds. The small shining object seen to the right of Kepler-62f is Kepler-62e. Orbiting on the inner edge of the habitable zone, Kepler-62e is roughly 60 percent larger than Earth. Image credit: NASA Ames/JPL-Caltech. While the symposium was not talking much about life in the solar system, Europa is considered one of the top candidates due to the presence of a possible subsurface ocean beneath its ice. NASA is now seeking ideas for a mission to this moon, following news that water plumes were spotted spewing from the moon’s icy south pole. A mission to Europa would take seven years with the technology currently in NASA’s hands, but the SLS would be powerful enough to speed up the trip to only three years, Grunsfeld said. And that’s not all that SLS could do. If it does bring astronauts deeper in space as NASA hopes it will, this opens up a range of destinations for them to go to. Usually NASA talks about this in terms of its human asteroid mission, an idea it has been working on and pitching for the past year to a skeptical, budget-conscious Congress. But in passing, John Mather (NASA’s senior project scientist for Webb) said it’s possible astronauts could be sent to maintain the telescope. Webb is supposed to be parked in a Lagrange point (gravitationally stable location) in the exact opposite direction of the sun, almost a million miles away. It’s a big contrast to the Hubble Space Telescope, which was conveniently parked in low Earth orbit for astronauts to fix every so often with the space shuttle. 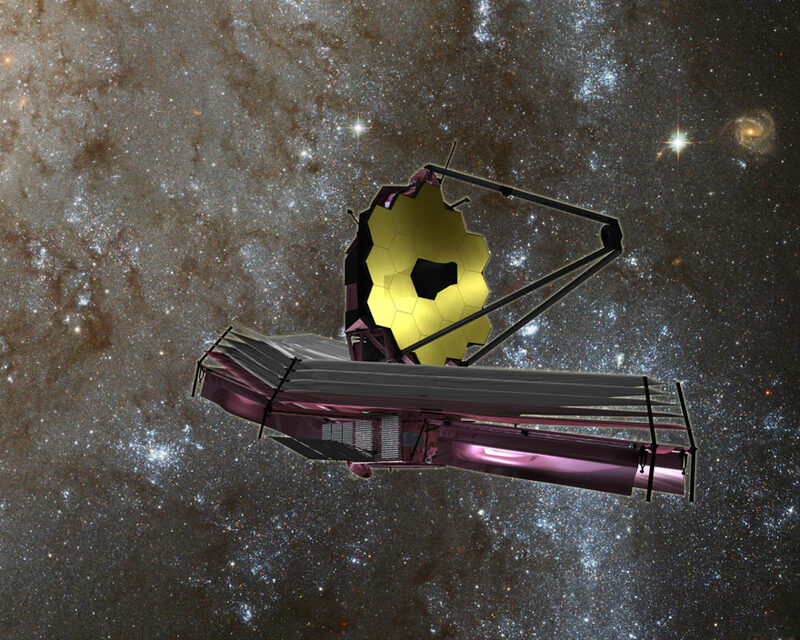 An Artist’s Conception of the James Webb Space Telescope. Credit: ESA. While NASA works on the funding and design for larger telescope mirrors, Webb is one of the two new space telescopes it is focusing on in the search for life. Webb’s infrared eyes will be able to peer at solar systems being born, once it is launched in 2018. Complementary to that will be the Transiting Exoplanet Survey Satellite, which will fly in 2017 and examine planets that pass in front of their parent stars to find elements in their atmospheres. The usual cautions apply when talking about this article: NASA is talking about several missions under development, and it is unclear yet what the success of SLS or any of these will be until they are battle-tested in space. But what this discussion does show is the agency is trying to find many purposes for its next-generation rocket, and working to align it to astrophysics goals as well as its desire to send humans further out in the solar system.